The White Tower (Lefkós Pýrgos) is one of the best-loved buildings in Thessaloniki, a dumpy cylinder topped with turrets that sits at the southern end of the seafront promenade of Nikis Avenue. Thought to have been built on the top of Byzantine remains during the reign of Suleiman I the Magnificent in the mid 15th century, the six-story tower is 40 m (131 ft) high and 23 m (75.5 ft) in diameter, with sturdy stone walls dotted with tiny arrow slits. Originally it formed part of the city’s fortifications and was used by Thessaloniki’s Turkish invaders as a place of public execution. Since then the tower served as a communications center in World War I and later as a meteorological laboratory. Three more towers and a defense wall were knocked down after the fire of 1917, and its current use is as a visitor center with an exhibition detailing the turbulent history of the city. A viewing platform at the top of the tower looks out over the sea in one direction and the rooftops of Thessaloniki to the other. One of the most popular evening pastimes for Thessaloniki locals is the waterside stroll up Nikis Avenue, starting at the old port and winding up in front of the White Tower. Nikis Avenue, Thessaloniki. Opening hours Tue–Sun 8.30am–3pm. Admission adults €3; seniors, students and under 18s €2. Best accessed on foot along the waterfront promenade; it is a ten-minute walk from Thessaloniki train station. Experience the rich historical legacy of Thessaloniki during this private walking tour led by a local archaeologist. Discover a variety of UNESCO World Heritage monuments from the Byzantine and Roman eras, visit the famous White Tower, and step back in time at the Greek Agora and Roman Forum. A private guide and a snack are included. Since the middle of the fourteenth century, over twenty monasteries have been built at the top of Meteora, a precipitous rock formation of pillars and cliffs that looms over the Greek countryside. Only six remain today; on this tour, you’ll visit two perched atop these ‘columns of the sky’. Spend your morning in close encounter with these marvels of faith and architectural prowess, then take the afternoon to explore Kalabaka, the town at the foot of the pillars. If you’d prefer to avoid the parking hell that is downtown Thessaloniki, take it easy on this guided city tour. Stroll through the streets of the Old Town and walk along the city walls. See sights from the White Tower to the Arch of Galerius, the Rotunda, and the Church of Agios Dimitrios, and stop at the Archaeological Museum of Thessaloniki. Tour includes transfers and guiding but excludes entrance fees. Tour the highlights of Thessaloniki on a half day tour. With a local guide, visit popular sites such as the White Tower, Galerius Arch, the Rotunda monument, Old Town (Ano Poli) and the city walls, and Demetrius Byzantine church and its crypt. You will also have a chance to visit the Archeological Museum of Thessaloniki. Transportation by air-conditioned coach is included, but entrance fees are not. Explore Thessaloniki on a half-day tour, and discover the history of monuments such as the White Tower and Agios Demetrius Byzantine church. Learn about the city’s historical importance and sights from your guide, and pay a visit to the Archaeological Museum of Thessaloniki to see artifacts from a range of eras including the Classical and Hellenistic periods. The entrance fee is at your own expense. Grab a helmet, hop on a bike, and get to know charismatic Thessaloniki on two wheels. Explore magnificent monuments, discover the city’s coolest cafes and hang-out spots, glide along the picturesque waterfront and find out more about Thessaloniki’s thrilling ancient past and how it has transformed itself into Greece’s second largest and most important city in recent years. 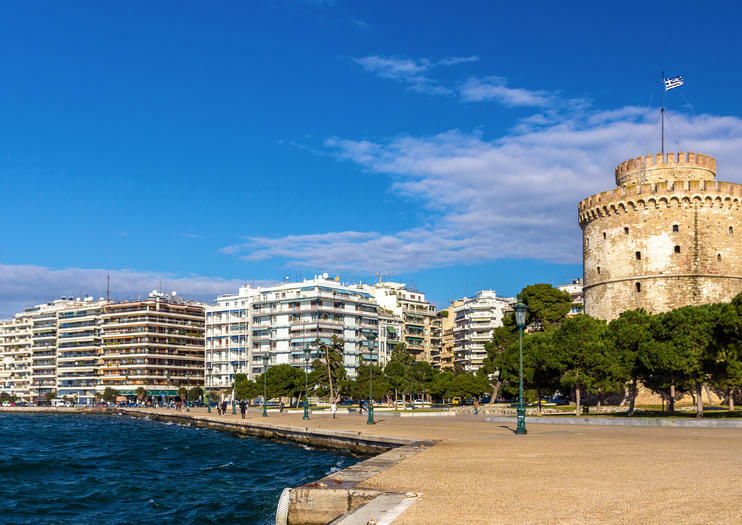 The tour begins at the White Tower of Thessaloniki, which is the most commonly known monument of Thessaloniki and the symbol of the city because of its prominent position, long history and implosive architecture. Your tour then continues towards the Nea Paralia where you will be able to see the statue of Alexander the Great and then you can admire the famous umbrellas a true ornament of the City. Coming back you will visit the OTE Tower located in Thessaloniki’s International Fair Grounds and from there you have the option to enjoy your coffee on the Tower’s café bar or to follow the rest of the group at the final stops on the Arch of Galerius (Kamara). The highlight walking tour lets you see the most amazing sights of Thessaloniki on foot. Explore traditional Greek markets and marvel at the White Tower situated on the beautiful boulevard. Discover the secrets of the city and the ancient Roman history. During the ‘Culinary walking tour’ you will be using all your senses to get to know the Greek kitchen. Your enthusiastic tour leader can not wait to let you taste all the good stuff and tell you everything about the local habits. We walk through the city center and visit local shops, either immemorial or modern and a bit more luxurious. We introduce you to the proud owners of the family businesses and of course we’ll be visiting the central market! Want to get away from the buzzing city center of Thessaloniki? Join our coastline tour and cycle the well-known Thessaloniki promenade with us. The promenade is one of the most important meeting places for the young and older people of Thessaloniki and – especially on Sundays – the place to see and be seen. Escape the busy footpaths of Thessaloniki and take to the sea for this relaxing half day of sailing along the coast. Whether you’ve just arrived in the city or you want to see landmarks like the White Tower from the sea, this sailing trip offers grand views of the Thessaloniki cityscape. If the weather allows, extend your trip with stops at charming coastal villages like Neoi Epivates and Peraia. The highlight tour lets you see the most amazing sights of Thessaloniki by bike. Explore traditional Greek markets and marvel at the White Tower situated on the beautiful boulevard. Discover the secrets of the city and the ancient Roman history. All provided by a local guide.